Early this month, the UK’s powerful Jewish Lobby stopped Nation of Islam leader Louis Farrakhan, the most hated Black person by the organized Jewry followed by Malcolm X and Muhammad Ali, to speak at Africa International Day of Action event in London on August 5 via video (listen to Farrakhan’s speech below). 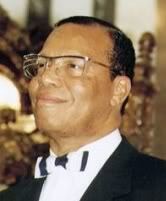 Farrakhan was banned by Margaret Thatcher, a blind supporter of Israel in 1986. All successive governments maintained that ban to please country’s Jewish Lobby which controls all four major political parties, even though in 2001, UK’s high court Justice Turner ruled that the ban must be quashed. Last year, Farrakhan was interviewed by Crypto-Zionist Alex Jones. The US Democrat congressman Danny K. Davis said he was disgusted by British censor of Farrakhan’s right to speak the truth. He promised to raise this issue in the Congress (here). Other anti-Israel activists got banned by the UK’s Jewish Lobby include French comedian Dieudonné M’bala M’bala, Hungary’s opposition leader Gabor Vona, Dyab Abou Jahjah, founder of Belgium-based Arab European League, and American student leader Matthew Heimbach.